These papers may be useful examples. 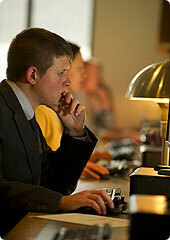 Be sure to verify all formatting with your thesis committee. If a question comes up during your research, please ask! Note: Within the larger Manuscript Format thesis document, Chapter Heading Pages (see Figure 1 below) precede individual manuscripts that have already been published. Manuscripts must uniformly conform to these thesis guidelines. Page numbers must appear at the top right corner of pages, at least 1inch from the top edge of the page and at least 1 inch from the right edge of the page. Page numbers must not invade any margins. There should be at least one return between the page number and the first line of text. Use regular, unadorned print, 10- to 12-point size for text (headings may be 14-point only if all headings are 14-point). Use the same font style and font size throughout. 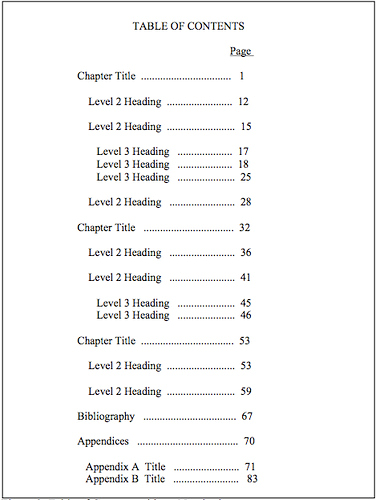 Chapter names are Level 1 headings. Subheadings of a chapter are Level 2 headings. Subheadings of chapter subheadings are Level 3 headings, and so forth. Each level must look different from the other levels. Headings of the same level must look the same throughout the document. All headings, regardless of level, must be the same font size. Either number all headings or number none (See figures 9 and 10). Single space headings that are more than one line, and use adequate and consistent spacing between headings and the text. A minimum of two subheadings may be used within a given level. Each level 1 heading begins a new page. Use Blocked Quotes for quoted material longer than three lines. Use the same font size as within the text. Single-space the quotation, and indent it evenly on both sides. There is no need to justify quotations. Use the same font size as within the text. Choose a reference style with the guidance of your major professor and your committee and be consistent. Single-space each citation, and use adequate and consistent spacing between citations. Footnotes collected at the end of a chapter are called endnotes. Use the same font size as within the text. Single-space each endnote, and use adequate and consistent spacing between endnotes. No orphan lines may appear at the top or bottom of a page. No headers or footers may be used. Footnotes are acceptable. Figures include charts, diagrams, drawings, examples, graphs, illustrations, maps, photographs, etc. In the majority of cases, if it’s not a table, it is a figure. A figure’s labels denote the type of figure and its number, and a figure’s caption is its title and description. Every figure must have a label and caption unless there is only one figure of its type in the document. Use consecutive label numbers by order of appearance within the text. Each figure must have a unique number. Illustrations that take up more than one page should have the label followed by “(Continued)” on the second page. Label and caption font size is the same as body text size. Use adequate (at least one return) and consistent spacing between and figure and its label and caption and between the figure and text. A figure’s label and caption should be placed outside its boundaries, commonly above a table and below an illustration. If both a figure and its label and caption do not fit on one page, place only the label on the page with the figure, and place the label and caption on a separate page that precedes the figure (called a legend page). Single-space the label and caption and center it 1/3 of the way down the page. Include no other text on this page. All figures must be listed in the pretext pages’ List of Figures. List the page number of the legend page in the pretext list. Are located above the table, on the same page as the table. 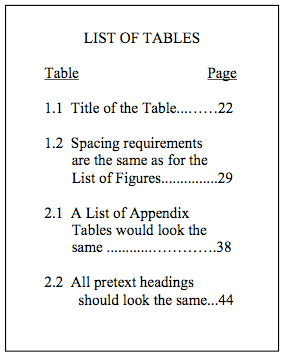 Table captions should contain the illustration number, i.e., Table 1 and its title. You may number tables consecutively throughout the text or within the chapter, i.e., Table 1.1 for the first table in Chapter 1 and Table 2.1 for the first title in Chapter 2. As always, pick one method and use it consistently throughout your document. Figures should be photocopied directly onto the cotton bond paper whenever possible. If it is necessary to use original figures, they must be mounted onto the cotton bond paper with a spray adhesive. Rubber cement should not be used, because it yellows and deteriorates over time. To test if your figure is correctly mounted, put your fingernail under an edge and try to lift it away from the cotton bond paper—if it lifts even slightly at any edge, you must fasten it again. 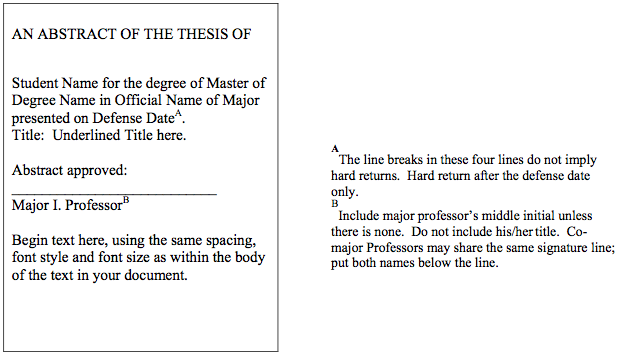 Regardless of general format, the thesis includes particular parts in an established order as listed below. Model pages are provided for most pretext pages. In all cases, margin requirements apply (see above) and the same font style/size must be used in the body of the text and elsewhere. All titles of pretext pages should be formatted identically with respect to font size and style. 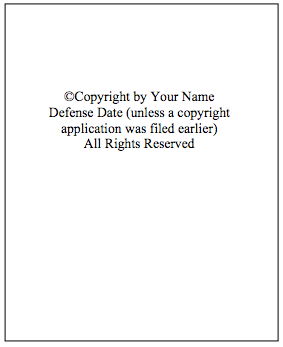 Copyright Page (see Figure 3)—optional but recommended. 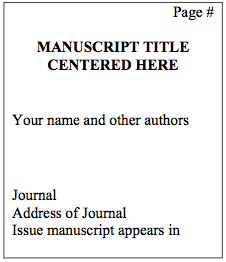 Print your name exactly as you did in the Abstract. Wording should begin 10 returns from the first line. Approval Page (see Figure 5). 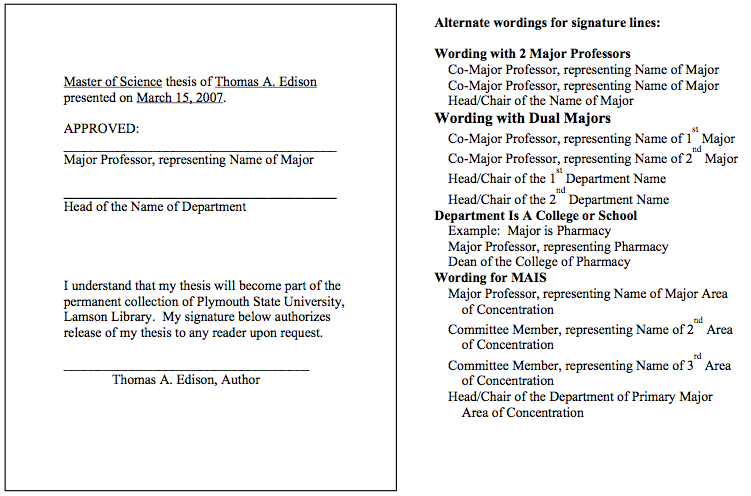 On the Approval Page, the Major Professor represents the major. 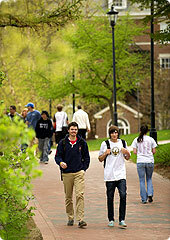 The Approval Page considers your advisor as your major professor, regardless of his/her official rank or tenure home. 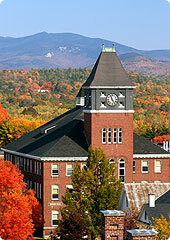 Official major names and department names can be found in the Graduate Catalog. 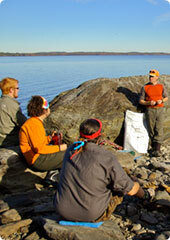 Some majors and departments have the same name while others differ. The major name used on the Approval Page should exactly match the one on the Abstract. All signatures collected on the library copies’ approval pages must be original. 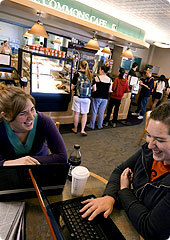 Your signature constitutes consent to have your document available for public reference in Lamson Library. 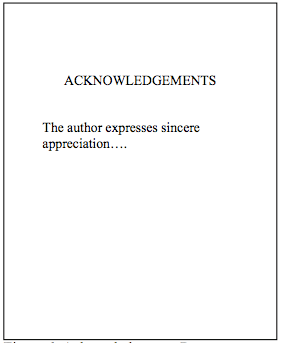 Acknowledgments (see Figure 6)—optional but recommended. The exact content of this page is up to you. Use same text spacing either 1.5 or double space. Table of Contents (see figures 8 and 9). Ensure that the page numbers accurately reflect where the headings appear in the text. 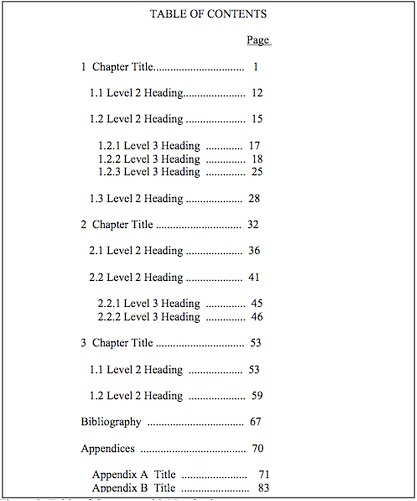 Listing the chapter headings in the Table of Contents is required; listing the subheadings is optional, and you may list some levels but not others. Levels are denoted by indention in the Table of Contents. Wording, spelling, and capitalization of headings in the Table of Contents must match the heading in the body of the text exactly. If headings are numbered in the Table of Contents, they must be numbered correspondingly in the text.List appendix or appendices (if applicable) in the Table of Contents or in a separate List of Appendices. In either case, list the Appendices Heading Page (see page 3) in the Table of Contents. When listing an individual appendix, include its title.If the Table of Contents is more than one page, subsequent pages should be headed “TABLE OF CONTENTS (Continued).”Return twice between the TABLE OF CONTENTS heading and the first item in the table. List of Figures (see figure 10). Lists are required if two or more figures appear within the text. List of Tables (see figure 11). Lists are required if two or more tables appear within the text.Choose one of the two methods of numbering in the model pages illustrated in Figures 10 and 11 and use it for both Lists of Figures and Lists of Tables. If a list is longer than one page, subsequent pages should be headed “LIST OF FIGURES (Continued)” or “LIST OF TABLES (Continued).” The first sentence of the figure or table caption must be listed, and the wording must match the text exactly. List only one page number per figure or table. 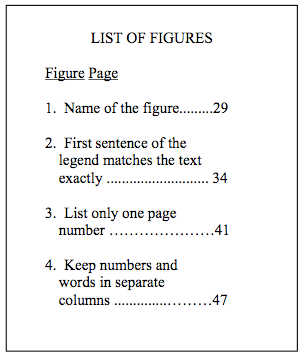 When there is a legend page in front of a figure (see information on FIGURES below), list the legend page only. 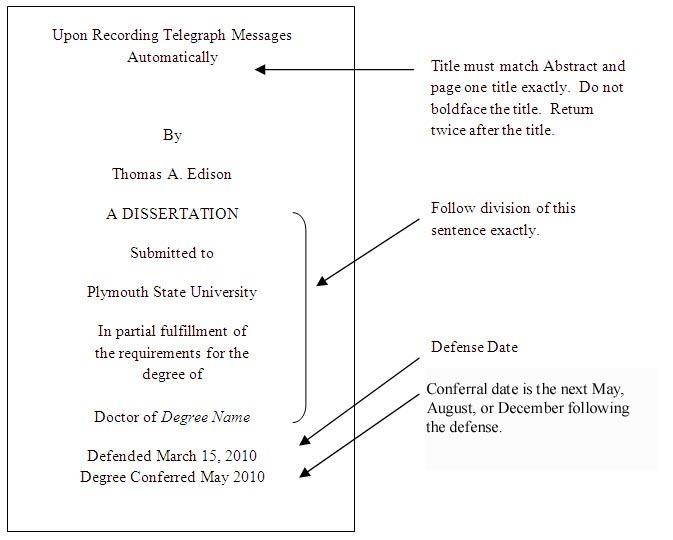 A biography of the candidate is optional and may be included in the thesis. It should be written in the third person and include the following information: place of birth, place of high school graduation, place and date of college graduation with degree(s) and major(s), professional or employment experience, scholarly publications, memberships in professional or honorary societies, and future plans or employment. The last sentence must state, “S/He is a candidate for the———degree in ——- from Plymouth State University in Month, Year.”.